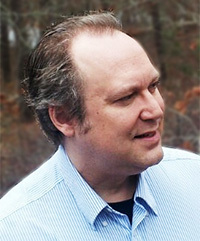 Bart Stewart’s debut novel – PAINTER OF THE HEAVENS – Now on Kindle! 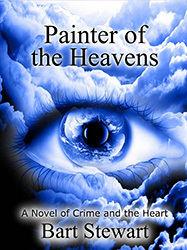 A Novel of Crime and the Heart, Painter of the Heavens is an atmospheric, character-driven story of a woman’s love affair with a potentially dangerous con artist. Penny doesn’t know at the start that Lyle is planning a massive financial fraud, and subtle suspense builds steadily. Painter has the feel of literary fiction as well as that of a noir psychological thriller. An Intelligent, Riveting Novel This book reads like the manic, adrenaline-fueled offspring of Carl Hiaasen and Elmore Leonard. I devoured this in two sittings. It’s really just your standard boy-meets-girl, girl-falls-for-boy, girl-finds-herself-ensnared-in-a-complex-forgery- scheme-with-her-criminal-sociopathic-boyfriend love story. Shot through with a cutting, merciless wit and energized by a madcap plot, Painter of the Heavens is the most fun I’ve had reading fiction in a while. This is a fine debut novel by an author whose enviable talent is matched by a large-hearted generosity for his damaged characters. Highly recommended. Painting with Words I couldn’t put it down! I love to read a great story…one that keeps me reading not wanting to put it down. “Painter of the Heavens” did just that. The vivid descriptions and intriguing characters, with a storyline that keeps you guessing what will happen next. You can get lost in the world painted by the author. Hope there is a second installment coming soon! Best read in a Long Time! I just finished reading Painter of the Heavens, by Bart Stewart. I must say that I was so impressed with this book. It was such an original. His style is almost poetic. This story truly drew me in and I felt like I was seeing everything vividly, through the main character’s eyes. I have never posted a review before, but I feel that this guy genuinely deserves accolades for his work. One of the most enjoyable stories I have ever experienced. In this tribute to old school, atmospheric horror, we follow a pair of black stone cat statues, very realistic in appearance. They become all too realistic from time to time. Are they statues that come horrifically to life, or something even more unexpected? 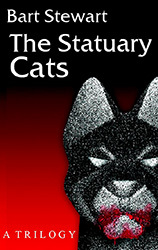 It’s the trilogy of The Statuary Cats, from Tales of Real and Dream Worlds, in eBook format! 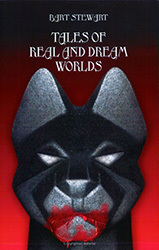 Tales of Real and Dream Worlds is fantasy fiction in the tradition of Richard Matheson, Rod Serling and H.G. Wells. The surreal, the unreal, and the all-too-real intertwine in these nine great short stories. We step out of the workaday world and see reality in a slightly different light here. At certain junctures we face horror, in the form of living carnivores that had not seemed to be alive before, or in bizarre telephone calls in the night from imperiled strangers, or in a career path available only in a future society. We visit the impoverished Rutherford family, who become entangled in the 1938 War of the Worlds radio hoax. Elsewhere a billionaire has some remarkable trouble involving a pair of restless sculptures in his art hoard. We experience the otherworldly day in the life of a honey bee. There is an odd tale called Dumpster of the Mind. And then there is The Jingle, a commercial ditty you will not be able to get out of your head. Ever. This is fiction that entertains and stimulates the mind. There are some dark passages, but only rare moments of violent imagery. The stories are not unduly cluttered with profanity. The book is intended for a general audience over 16 years of age. Once you have read them you will never forget — TALES OF REAL AND DREAM WORLDS!